Did you know there are several home air conditioner maintenance tasks you can do yourself to perform routine and preventative maintenance on your home AC system? While we still recommend having a qualified Charlotte HVAC contractor perform annual service on your home air conditioner, at little to no cost to you, there are many things you can do to your home HVAC system and help prevent inconvenient breakdowns? In this Charlotte HVAC Guide, we take a look at routine preventative tips for your home air conditioner maintenance. As always, we welcome your own suggestions or tips at the comments section of this article. 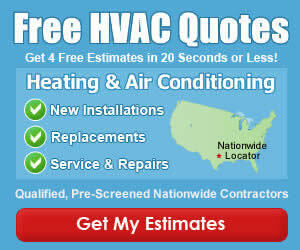 Note: If your air conditioner or heat pump system is not currently working, you might consider getting the ball rolling to get 3 free repair estimates now. The less time you have to worry about being hot… the better! The life of your home HVAC system is air, and the ability to flow air freely without restriction! That starts at the return air filters inside the home. Read the label on your air filters and change them out as recommended by the manufacturer. Go into your attic, mechanical closet or crawl space and look at your furnace or air handler. There should be nothing within 2-3 feet of the unit. Period. If you have old picture frames or anything leaning onto the top or sides of the unit, you should remove them. We previously mentioned that air flow is the key to a properly working home HVAC system. The duct system moves the conditioned air from the air handler to the rooms of your home. If you stack things onto the duct, it can become loose and leak, or worse, become restricted and not flow the right amount of air to the area. Many thermostats now use batteries as a source of power. If your home has this type of thermostat on the wall, make sure you replace the batteries twice a year, when you replace the smoke detector and carbon monoxide alarm batteries. Paying an $89 service call price (Learn more about HVAC Service Prices in Charlotte) to replace a dead battery is not going to make you happy! The condensate drain is the only way your home air conditioner has to remove the water generated by the air conditioner system. If it gets plugged, it can ruin ceilings, floors, carpets, and just about anything water can damage. During your annual maintenance, the AC Contractor usually cleans the line and makes sure to put algae tablets into the system to avoid seasonal buildup. You can also pickup condensate drain line tablets at stores like Lowes or Home Depot, to assist in keeping it clean. We have all run over a twig or rock with our lawnmower at some point. If your lawnmower discharge happens to be pointed at the condensing unit when you do, it is very likely it can puncture the coil and leave a hole that’s beyond repair. You would never aim the discharge chute at your own car or a window… Do your best to avoid aiming at the air conditioner or heat pump also! It could result in a pricey HVAC repair or ac replacement cost! Your outside condensing unit should be thoroughly taken apart and hosed on both the inside and outside once a year by a professional. This is usually included as part of maintenance plans. You should still wash off the outside of your unit at least twice a month to keep grass clippings, dust and debris from clogging the outer coil. I wash mine after every lawn mowing. Airflow around your outside unit is key to the system working properly! If grass grows into the base of the coil, branches crowd into the sides of the coil, or a shrub grows over the top of the unit… It will not only reduce the air conditioner or heat pumps ability to work, it will reduce its life. Keep at least a 18-24 inch clearance on all sides of the unit with an exposed coil, and at least 5 feet of clearance on the top or side where the condenser fan is located. Patterson Heating and Air of Charlotte recommends providing shade for the outside condensing unit on their Money Saving Tips page. Keep the above in mind when doing so and get a bit creative. Lattice boards can be installed 3 feet from the west side of the unit (west side is where the sunshine comes from during the hottest part of the day) and roses, or some other vine type plant can be planted. This will thoroughly shade the unit during the summer heat, and if you get real creative, you can find a way to reclaim the condensate water to water the plants automatically! Urine is very corrosive to all types of metal. If your dog or other pets can walk up to the outside condensing unit and urinate on it, it will corrode within a few years. I have actually seen units less than 5 years old need to be replaced due to all the cooling coil fins being rotted off from urination. If you have pets, put a small fence around the unit to keep them away! Your outside condensing unit should be level in order to allow proper water drainage, and proper operation of the compressor inside of it! While it will definitely run regardless, it is designed to operate on a level and sturdy foundation like a level concrete or wooden pad. Running the unit for long periods of time at even a slight angle, can reduce the life expectancy of the unit. We love to hear from you as well! 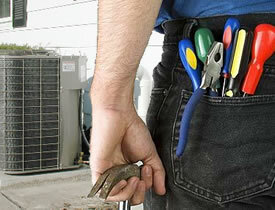 What tips do you recommend for Charlotte Home Air Conditioner Maintenance? WOW – WHAT A GREAT LIST OF TIPS FOR FREE! I can clearly relate to the tip about blowing the lawnmower away from the outside compressor. My hubby, the wise man he is, put a stone into the side of our coil and it cost more than $800 to repair last year! Anyhow – THANK YOU for the great list, I cannot wait to share with my sisters and friends on facebook! I wish I had a dollar for every yard we suggest shrub trimming to. Folks, when the bushes are up against the sides of the condensing unit, the air cant get to it and it dont run right! Trim the bushes at least the 24 inches recommended! Ouch… that was a costly lawn mowing for sure! Its hard for me to cut my own without coming close to one of the units so I keep a small 24 inch wide x 6 foot long piece of plywood handy to lay next to the unit when cutting the yard. Just a small piece of mind I guess, but its stopped a few large stones. Overgrown bushes and leaves built up around the base seem to be a very common problem. Thanks for the feedback!